Snapchat on Friday rolled out a set of three iPhone X-exclusive Lenses that use data from the TrueDepth camera array to mold realistic AR overlays, or masks, onto a user's face. 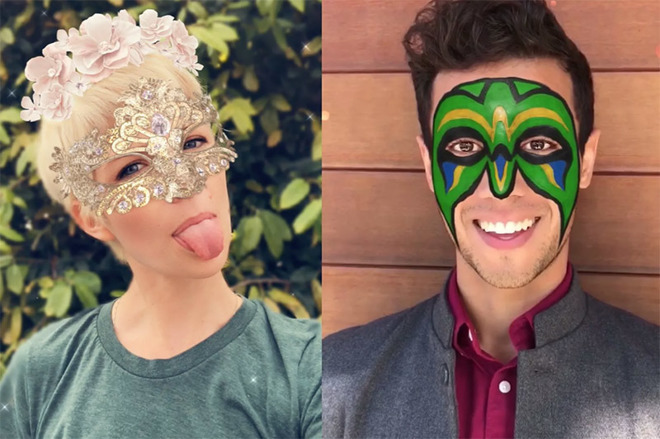 The new Snapchat Lenses, which include a Mardi Gras mask, Day of the Dead face paint with matching flower headdress and an ornate masquerade eye cover with rose hair ornaments, will begin rolling out to iPhone X users today, reports The Verge. As seen in the photos above, the TrueDepth-enabled AR masks are more tightly mapped to a user's facial topography than the usual Lenses offerings. Unlike traditional Lenses that rely on information from a phone's 2D camera to recognize dominant facial features, like a user's eyebrows and mouth, iPhone X Lenses tap into data produced by TrueDepth. The depth information allows Snapchat to more accurately pin virtual objects onto a subject's face. Thanks to TrueDepth, the Lenses reflect surrounding light in a more realistic manner and add a touch of blur to the background, Snap said. Snapchat first previewed its specialized iPhone X Lenses at Apple's iPhone event in September, where Apple SVP of Software Engineering Craig Federighi conducted a short onstage demonstration showing off the feature's ability to track facial movements. Snapchat is one of the first major apps to integrate TrueDepth facial data since iPhone X launched in November. Apple's facial recognition system and underlying depth-sensing technology sparked the concern of privacy advocates, who questioned whether third parties should be granted access to such sensitive data. Currently, Apple strictly limits developer access to TrueDepth. Specifically, the mathematical representation of a user's face, utilized for Face ID authentication, is kept secure and remains inaccessible by third parties. Apps can, however, access visual mapping data generated by TrueDepth, as well a set of 50 different facial expressions, the latter of which powers Apple's Animoji feature. Apple in its developer agreement states face data cannot be used for advertising, marketing or generating user profiles. Last year, an Apple employee not authorized to speak publicly about the matter told AppleInsider that developer access to TrueDepth data is "profoundly, seriously limited." Apple's most advanced biometric security solution, TrueDepth and Face ID are expected to make their way into other product lines in the coming months, with the latest rumors suggesting iPad Pro is next in line to receive an upgrade.